This is my entry for the first Stampers Division DT. I decided to post one of the pages from my first acrylic album. I used StazOn ink in Dove Gray and stamped a flower pattern all over the heart sheet. 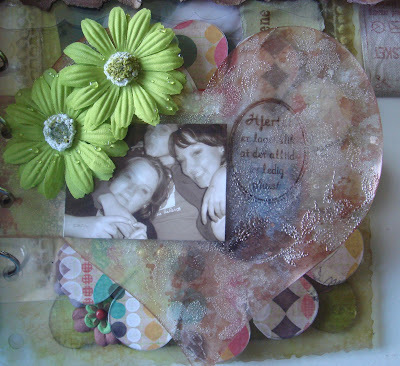 I then used clear embossing powder and heat embossed the hole heart. The acrylic sheet bent a little, but I like the look of the "well used heart". I inked it using Adirondack Alcohol ink in two colours (green and brown), blending them together at the middle. I also inked the edges of the heart using the brown alcohol ink. I used the blending solution and the Pearl Mixative. The stamped sentiment says: The heart is made so that there is always room for more. I used Timber Brown StazOn ink for this. The green flowers ties in with the rest of the album, and the photo is of me and two of my bfs. The album was made for one of them and I gave it to her on her hen night last weekend. I will probably post more pages from it at a later point. It ended up with about 3o LOs, so there is a lot to pick from!